When you bring your itty, bitty baby home from the hospital, a simple sponge bath is all you need. You’ll want to wait until your newborn’s umbilical cord stump has fallen off and his belly button has healed up before giving baby a submerged wash. This can take up to 3 weeks. In the meantime, start with a gentle wash for your newborn. When everything is ready, it’s time to get your little one. You can wash baby up on his changing table or the floor. It’s not necessary to have baby in a baby tub for a sponge bath. Start with a cloth under baby so she doesn’t slip. Wash the cleanest areas first and work toward the dirtiest. Rinse well. Wash only the outside of baby’s ears and do not put anything inside baby’s ears. Check twice behind the ears. They like to hide stinkies there and in the folds of the skin in the neck. For girls, wash the genital area front to back and gently clean between the folds of skin. Especially the first few times, your baby may not like being set in the water or having it poured on her. Some people use a shampoo shield to protect baby from getting shampoo or soapy water in her eyes. Many moms also just use an extra wash cloth for this. 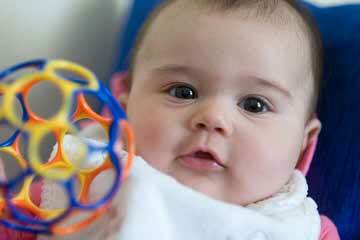 Scrub your baby's scalp with a soft brush or tooth brush and rinse well to avoid cradle cap. Hold baby firmly. They do like to wiggle.